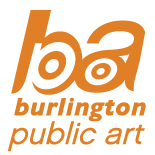 The City of Burlington Public Art Program is pleased to announce that Ken Hall has been selected by a community jury, with input from public engagement, for the Spirit of Sport public art project. Online and in-person public engagement took place in February and gathered feedback from 135 residents, which helped inform the jury’s decision. The Spirit of Sport public art project aims to celebrate Burlington’s long history of sports excellence, on both an amateur and professional level. A series of three small to medium-scale, exterior public artworks will be installed at the following: Mainway Recreation Centre, Brant Hills Community Centre and Nelson Recreation Centre. These locations were selected as they represent a broad range of types of sport as well as different levels of play, ranging from children/youth to competitive play. The artwork is being created over the summer and will be installed in fall 2018. To honour this Spirit of Sport, red ribbon-like sculptures will celebrate active living and inclusive community participation, while engaging and welcoming the public to the recreation centres. The red ribbons reflect key components of many activities, such as the flowing rhythm of gymnastics; the curved, red stitching on a baseball; the goal line in hockey; and the finish line in track and field, among others. The fluttering ribbon is a perfect form for these sculptures, having long been associated with sporting excellence; whether being used to support medals won at competitive events, or as a means of celebrating participation in community activities, such as awareness walks for issues like breast cancer. The association with medals is particularly relevant given the City of Burlington’s rich history of sporting innovation, which includes: Dr. Frank Hayden, founder of the International Special Olympics Movement; Melville Marks Robinson, founder of the Commonwealth Games; along with numerous Olympic athletes and coaches, including Melanie Booth (soccer) and Angela Coughlan (swimming). The rolling ribbon also celebrates a heart-healthy, active lifestyle, calling to mind the visualization of a heartbeat on an EKG machine. The red colour represents the circulation of oxygenated blood, reminding us that regardless of age, ethnicity or gender, we all benefit from active physical and social participation. Artist Ken Hall’s evocative and engaging public installations bring people together, provoking collective thought and discussion, while examining our relationships to each other and the natural world. Teeming with energy and movement, Ken’s pieces explore complex social and ecological issues in an uplifting and inclusive fashion, becoming talismans of awareness and change. His numerous public commissions grace urban centres and rural locations across North America. Ken’s award-winning environmental installation Legacy was recently covered by the Smithsonian and is currently touring North America. It can be experienced at Ontario Science Centre until the end of 2017.